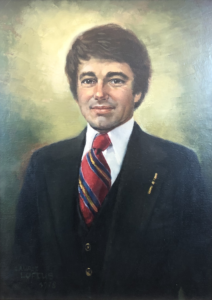 In 1977, Northeastern University established an endowed fund to support the Library in the memory of F. André Favat, an associate professor of English education in the Department of Instruction. Dr. Favat had died the previous year at age 38. At the time of his death, Dr. Favat was also director of the National Council of Teachers of English and president of the Massachusetts Council of Teachers of English. The fund is designated for the purchase and preservation of books, primarily children’s literature and books on education. Dr. Favat’s experience in curriculum development and the teaching of future educators led to the naming of the curriculum center at Northeastern as the Favat Center for Curriculum Materials and Children’s Literature. This center moved into Snell Library when the building opened in 1990. At a time when teacher education was a popular program of study at Northeastern, the Favat collection was used primarily by student teachers as well as students in a regularly offered children’s literature course. Longtime Library staff also recall parents browsing the collection for their kids, and children from Northeastern’s Call Childcare Center being brought for visits! However, for some time now, the collection has included a significant number of young adult (YA) titles as well as books for younger readers. As the collection became used less for teaching purposes, we observed that it was being used more by our students, faculty, and staff for recreational reading. YA literature has become extremely popular reading material for adult readers as well as teens, as any Harry Potter or Katniss Everdeen fan would tell you. So, we decided to expand the collection name to the Favat Children’s & Young Adult Collection, in order to more accurately convey to our users what kind of books they might find there. The historical children’s and young adult collection that now makes up a significant portion of the Favat Children’s & Young Adult Collection comes from the original curriculum center. The more current additions to the collection represent the best in children’s and YA literature through collection of the major American award-winning titles as well as a popular YA literature collection strong in fantasy, science fiction and modern young adult literature. The Favat Collection currently contains 10,226 titles—over the past five years, an average of 130 titles per year are added. It is managed by Janet Morrow, our Head of Resource and Discovery Services. Thank you to Janet for providing information about the Favat Collection, past and present, for this post! Materials in the Favat Collection are located on the third floor of Snell Library. Some new materials may be shelved temporarily in The Hub on the first floor. The Archives and Special Collections also hold the papers of Dr. Favat. Now’s Your Chance to Meet the Press! 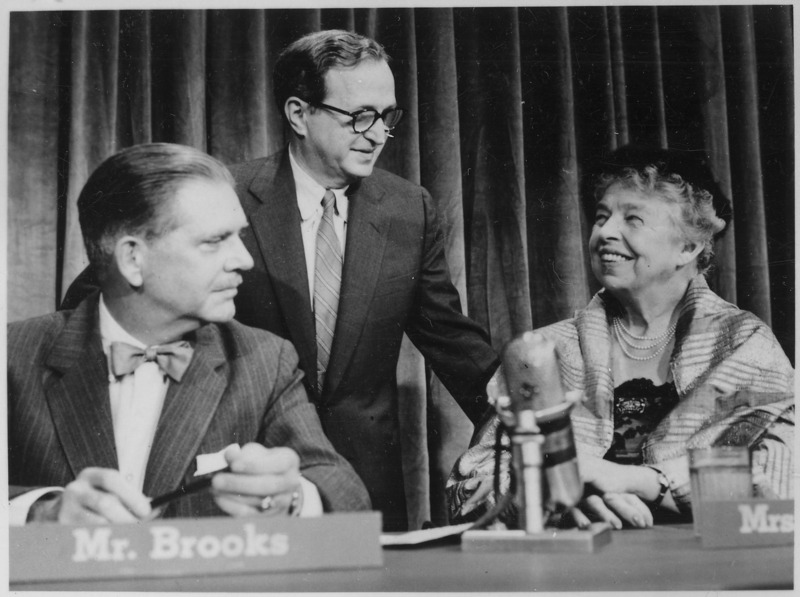 September 16, 1956: Eleanor Roosevelt is seated at a table on the Meet the Press set in New York City. She is smiling at a man standing behind her. 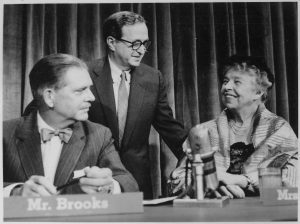 Host Ned Brooks is seated next to them. Meet the Press has been on television longer than any other program in history. The show premiered in 1947, and it’s been a cornerstone of the American cultural and political landscape ever since. It’s the first show to ever conduct a live interview via satellite (in 1965, with British Prime Minister Harold Wilson) and the first live network news show to ever host a sitting president (Gerald Ford, in 1975). Since Ford, every American president has dropped by Meet the Press at least once. Now, all of this history, much of which has been unseen since its original television broadcast, is just a few clicks away. Over the summer, Snell Library acquired access to the full surviving run of Meet the Press, from 1947 to today, through Alexander Street Press. That’s almost 1500 hours—or 62.5 days—of video available to you for free, dating back to 1957. You can watch Eleanor Roosevelt talk politics in the 1950s; see Martin Luther King, Jr. discuss the Civil Rights movement in the 1960s; hear Dan Rostenkowski describe Reaganomics in the 1980s; or watch Ross Perot’s presidential campaign unfold in the 1990s. Many episodes include detailed transcripts and closed captioning. Meet the Press is available from our A-Z Databases list. You can also click here for direct access. If you are off campus, you may be asked to sign in with your NEU ID and password. Summertime, and the viewing is easy… a perfect time to catch up on movies and documentaries. When it’s too hot to sit outside with a good book, crank up the a.c. close the curtains, get out some snacks and hit play. Pick your format! Snell Library has excellent DVD and streaming video collections. See this year’s academy award winning films on DVD. Classics, contemporary films, and documentaries will expand your horizons. Locate videos by subject, keyword or title in Scholar OneSearch. Use this streaming media guide to locate titles by vendor and subject. Our largest vendors are Academic Video Online Premium and Kanopy with a wealth of informative and entertaining choices. Charlie Chaplin silent films – see a few! Diabolique- a French murder tale–don’t miss this classic. Reaching for the Moon – depicts the relationship between poet Elizabeth Bishop and architect Lota de Macedo Soares. 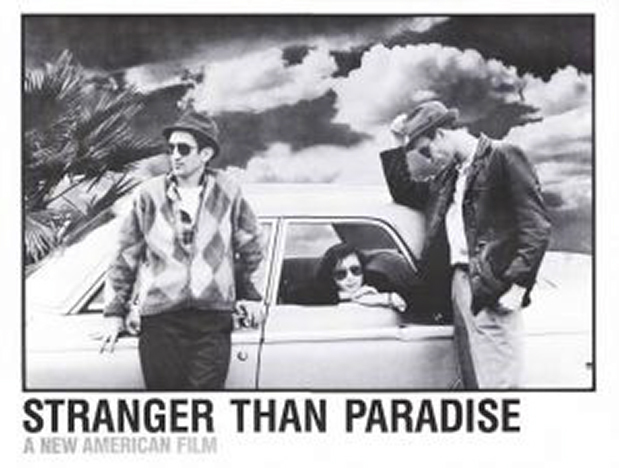 Stranger than Paradise– Jim Jarmusch’s transcendent adventures of a Hungarian émigré, his friend, and cousin. The Belle of Amherst –a 1976 theatrical performance of Emily Dickinson by Julie Harris. See Cynthia Nixon’s portrayal of Emily in the film “A Quiet Passion” playing in local theaters. Grey Gardens– meet eccentric Big and Little Edie Beale: mother and daughter, high-society dropouts, and reclusive cousins of Jackie Onassis. Music of Strangers: Yo-Yo Ma and the Silk Road Ensemble- be entertained by these international traveling musicians. Notes on Blindness– a mesmerizing experience of John Hull’s experience becoming blind as an adult, and how he has adapted to a world without sight. Photography Transformed:1960-1999– key photographers discusses photography’s effect on American life. 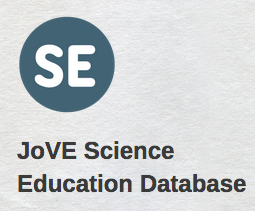 Here’s a sample of the videos the JoVE Science Education Database has to offer: Making Solutions in the Laboratory We hope you find these video collections useful in your work. Let us know what you think of them! In the wake of the events that occurred on April 15, 2013 at the 117th Boston Marathon and on April 19, 2013 in Watertown, Northeastern University English Professor Elizabeth Maddock Dillon and Assistant Professor Ryan Cordell recognized the obvious need for a space where people could tell and share their stories with each other. They believed that sharing stories from survivors, families, witnesses, visitors to the city, and everyone around the world touched by the event will speed the healing process, and wanted to create that space as a gift to the community. Together, they established the Our Marathon: The Boston Bombing Digital Archive, a crowd-sourced, digital archive of pictures, videos, stories, and social media related to the Boston Marathon bombing. Thus far, they have acquired an archive of almost 10,000 items, 3 interactive exhibits, and 3 major collections. This summer, I contributed to this remarkable endeavor as a Simmons School of Library and Information Science (SLIS) graduate summer intern sponsored by the Northeastern University Archives and Special Collections Department and supported by the Project Co-Director James McGrath. In addition to exhibit building and social media, the main task of my internship was to create lesson plans for schoolroom use. Because children were affected by this crisis as well, the team at Our Marathon thought it would help the healing process for children to use the Our Marathon archives—to remember and share stories in the safety of their own classrooms. Additionally, it can be difficult for teachers to navigate the complex questions young students ask and a resource like the digital archive can work as a great tool to facilitate age appropriate discussion. To that end, I helped create a Teaching Resources page for Our Marathon. This page showcases five lesson plans for Kindergarten through Grade 12 that utilize Letters to the City of Boston and The Copley Square Memorial collections, and the WBUR Oral History Project as the basis for a teaching unit. These lesson plans are designed to demonstrate mastery of grade and subject appropriate Common Core Standards. Hopefully, these assignments will generate more student submissions to the archive as well as create a platform for an important dialogue amongst students and teachers. I look forward to reading about their experiences in the Our Marathon archives.